Penn State continued its stellar run this season by claiming the Big Ten championship and extending its winning streak to nine. The victory bolsters the Nittany Lions' case for the College Football Playoff, though another team from the conference likely will represent the Big Ten in the national semifinals. INDIANAPOLIS — A Big Ten team will make the College Football Playoff. It probably won’t be the Big Ten champion. Penn State beat Wisconsin 38-31 Saturday night in a game that was thrilling and classic and anointed a nominal league titleist but in reality featured the third- and fourth-best teams in the conference, a scenario that earns them rings and a lifetime of debating semantics with sneering graduates of other schools. 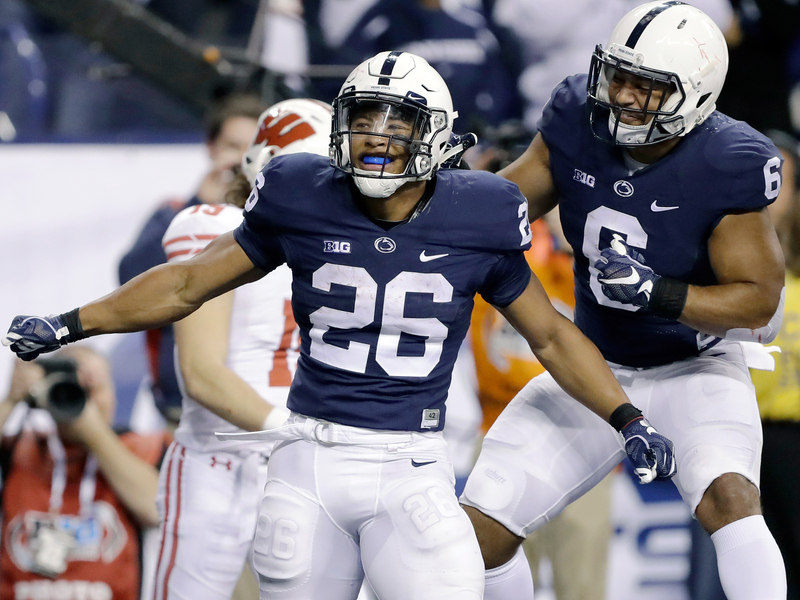 Arguments can and will be made that the all-consuming specter of the playoff significantly diminished the proceedings at Lucas Oil Stadium, that the Nittany Lions sifted through the streamers and confetti for a consolation prize. And all this after the commissioner of the league went on television earlier in the day and conceded he had to be O.K. with a non-champion representing his league in the playoff, when he campaigned against that very thing when the playoff was first built. And somehow the Big Ten and Jim Delany win even when they lose, or at least when they don’t exactly get their way. If the idea is to deliver a national championship, then the league is better off having Ohio State try to do so than either of the teams on display Saturday. (Wisconsin is one thing; scaling Mount Saban is quite another.) And no other conference in the country entered the weekend with even a fleeting hope of getting more than one program into the CFP; the Big Ten, if you squinted, arguably had a faint hope of placing three into the bracket. So the league championship game turned into a pretty rote exercise, the sort of thing you do out of reflex without any real meaning, like cracking knuckles. There were still 61,058 fans in the building for Penn State's victory. And so Delany appeared to eat some crow during a College GameDay appearance Saturday morning. He had to get the bites in between laughs. No, this was a healthy result for a league with renewed fortitude and an auspicious trajectory. It’s a little hazardous to project Big Ten stability after a year that featured rock-solid Michigan State falling off a cliff. But there’s enough to build on for all four teams that began the weekend in the playoff discussion (Ohio State and Michigan, plus the teams that played Saturday) to expect they’ll continue to have the capacity to make runs like they did in 2016. Putting three or four teams in the top 10 seems reasonably sustainable, especially if the league’s bottom-feeders struggle to improve and nine-game conference schedules remain full of wins. Penn State made a respectable run at that distinction on Saturday, and if ever there were a program desperate to direct everyone’s attention to the future instead of the past, well, this would be the one. Of course one win or one championship banner doesn’t make everything O.K., to say the least. (And people already got a little loose with the redemption talk and where they placed the pity once the result rolled in). But if we’re permitted to narrow the focus to football in the here-and-now-and-moving-forward, the Nittany Lions are emblematic of what may come in the Big Ten, because they may be preposterously fun for a little while. This is a team that was down three scores after being ground to dust by Wisconsin early on. Then an incautious and extroverted offense with a desperado at the helm came alive. Quarterback Trace McSorley threw for 384 yards and a Big Ten title-game record four touchdowns and at one point was averaging nearly 19 yards per completion. And that doesn’t even get to Barkley, who was the Big Ten offensive player of the year. Basically everyone on that side of the ball is back for 2017, and though the turnover on defense will be much more abundant, the potential for more of the same from the Nittany Lions is tantalizing. But two-loss teams are two-loss teams, and there almost surely wasn’t a large enough gag elsewhere in the country to nudge the Big Ten champion into the playoff field. Not even with a nine-game win streak capped by a staggering comeback from three scores down. And a team that was nowhere near Indianapolis and the league championship trophy on Saturday night likely will take the Big Ten’s shot at a national title, while the one team that beat it won’t get the chance. And that committee probably will see two losses, against the one loss on the record of the teams ahead of Franklin’s, and leave those rankings alone Sunday. It will be an extremely odd way for the best conference in the country to wrap things up. But the Big Ten wins even when it loses out in 2016, and judging by the way things are setting up, it may get multiple chances at do-overs down the line.